Almost everyone will suffer from back pain at some time in their lives. When it occurs, it can be very painful, debilitating and frightening. Staying active and consulting your local chiropractor can help you to achieve a faster recovery. Apart from treatment to ease the pain and help you to regain your mobility, your chiropractor can also advise you on exercises and other ways to try and prevent recurrence of the problem. Lower back pain is one of the most common complaints we receive as chiropractors. It’s hard to avoid back pain for your entire life, but receiving chiropractic back pain treatment (and staying active in the meantime) may well be the best solution. The Return 2 Health clinic is based in Barry, South Wales; if you live in that area and you suffer from lower back pain, we’d highly recommend paying us a visit. As we tell all of our patients – in Barry and beyond - one of the most common causes of back pain is poor posture. A lot of us know that we have poor posture but don’t know how to rectify it. As professional chiropractors, we can give you advice and exercises to help you improve this and combat your lower back pain. Spend hours at a desk or computer every day? Slouch when you watch TV? Sleep in a bed that’s too hard or too soft? Find yourself hunching your back and shoulders? If you answered yes to any of these questions, call us today and book an appointment at our clinic in Barry. Don’t wait until you’re in pain to improve your posture! If you’re not sure whether or not we can help, fill out our online enquiry form or book your free 10 minute consultation today! Repeating daily activities such as bending, lifting and twisting may result in a ‘bad back’. Other common causes of lower back pain include car accidents, falls, sporting injuries and lifting heavy weights. All of these activities can lead to a slight decrease in movement in your joints that can then interfere with the nerves that pass through your spine, causing you pain. Here at R2H Barry, we will treat the cause of your back pain by increasing the movement in your joints, which will then reduce the irritation of the nerve and decrease your pain. Spinal disc herniation is a common cause of back pain, especially in adults aged between thirty and fifty. 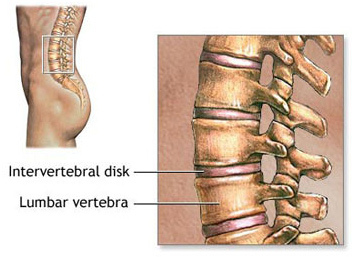 Spinal discs are fibrous rings containing a gel-like substance called nucleus pulposus. They are found between each of the vertebrae in your spine. Discs do not “slip” as such - they are attached to the vertebrae - but the nucleus pulposus can bulge and squeeze out like toothpaste from a tube. When this occurs, it can irritate the nerves that are found next to the discs; if these nerves become irritated by the nucleus pulposus, pain can occur in the back and legs. If you experience leg or back pain, it is important to visit a chiropractor for a diagnosis, as leg pain is not always sciatic in origin. Taking your history and giving you a full examination will allow our chiropractors in Barry to fully assess the area and explain the findings, addressing your lower back pain quickly and effectively. Here at the Return 2 Health chiropractic clinic, we specialise in expert back pain treatment. The clinic is on Castleland Street in Barry, and we are always happy to take new cases. Call 01446 740 002 to book an appointment – our lower back pain treatment is professional and effective.